Bruxism is one of the most common known sleep disorders and causes most of its damage during sleeping hours. The clenching and grinding which accompanies bruxism are symptomatic of a malfunctioning chewing reflex, which is turned off in non-sufferers when sleeping. For sufferers, deep sleep or even naps, cause the reflex nerve control center in the brain to turn off, and the reflex pathways to become active. An acrylic mouthguard can be designed from tooth impressions to minimize the abrasive action of tooth surfaces during normal sleep. Mouthguards should be worn on a long-term basis to help prevent tooth damage, damage to the temporomandibular joint and help to stabilize the occlusion. 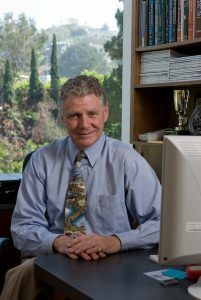 Other methods of treatment include relaxation exercises, stress management education, and biofeedback mechanisms. When the bruxing is under control, there are a variety of dental procedures such as crowns, gum grafts and crown lengthening that can restore a pleasant aesthetic appearance to the smile. When do I need a bite guard/night guard? The Bite Guard sometimes referred to as Night Guard or occlusal splint as it is more correctly called, is a protective shield that is worn between the teeth. It is principally used to protect the teeth from the damage of grinding or clenching of your teeth when asleep, or during periods of high stress. The splint is also used to separate the upper and lower teeth while the dentist is analyzing the way the teeth come together, and for de-programming disadvantageous muscle habits that affect the position of the jaw in relation to the Temporo-Mandibular Joint. 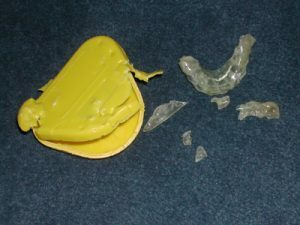 A bite guard is not the same thing as a protective Mouthguard (which has a use in protecting the teeth during sporting or combative situations). 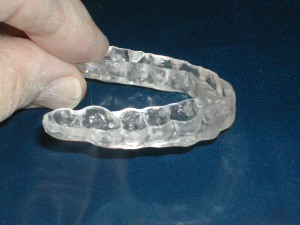 Soft night guards are rarely made and should not be worn for a long period of time or over many days because they cause the teeth to shift during clenching. 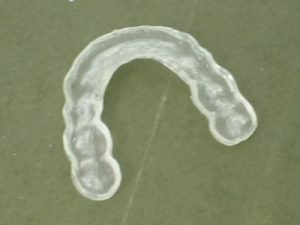 The Bite Guard is usually made of hard clear plastic and covers all of the teeth in one arch, most commonly the upper arch of teeth. Sometimes guards are made for the lower jaw, it depends on the jaw relationship and the problems being treated. The night guard covers all the teeth in one arch, and contact all the teeth in the opposing arch. It is usually adjusted so that all the teeth contact when the jaw is in its rearmost midmost position, often called centric relation. Again this is all due to the grinding or clenching of the teeth. A guard which is worn properly and kept clean can last about 36 months. It is not uncommon for the jaw to shift to a more comfortable position when using a guard, and then both the guard and the teeth may need adjustments. What type of bite guard is best? Patients often ask if they can just get a guard from a pharmacy or sports store and if that will do. The answer is no, I'm sorry. These guards need to be very accurately made and should be hard, not soft and flexible, so a doctor needs to make and adjust them. You should always bring your guard with you whenever you are coming to the dental office for a checkup or cleaning or for maintenance. Professional cleaning helps to preserve the usefulness of the appliance, and it may need to be modified with time. Please don't leave your guard where your pets can find it. They love the smell! When you bend a stick too much, the stick breaks. When you grind on a tooth too much, the tooth flexes and the area that bends compresses the crystals of tooth structure which dislodge and dissolves leaving a notch on the root. The notch is at the bottom front of the dental crown near the gums and is called a dental abfraction. Years ago dentists and hygienists believed that it was from brushing too hard but many patients who do not brush have these notches. Dentists now know that the notches are not due to hard bristle brushes or hard brushing. 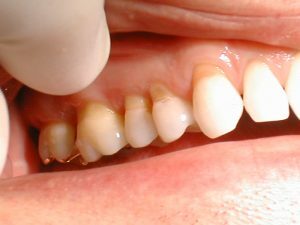 What do I need to know about Dental Abfraction? The most common teeth to suffer from dental abfractions are the bicuspid teeth, especially the upper bicuspids but the notches can also be found on cuspids and molars. The notch is created because the minerals that form the dental root crack off and dissolve due to the grinding pressures. This exposes the tooth inner surfaces of the tooth that is closer to the nerve and causes tooth sensitivity to hot and cold. Desensitizing toothpaste like Denquel or Sensodyne help reduce the sensitivity, but the real cause is tooth grinding. 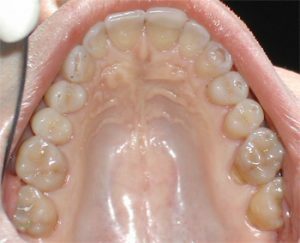 How to treat tooth abfractions? Some dentists attempt to fill the abfraction with white dental fillings called composites but because the tooth still flexes and bends, these white filling often pop out leaving a bigger hole than the original notch. We recommend that patients first get a protective guard before attempting to fill their notches. Up until now, research into the causes of abfractions seems to be divided into two camps- those who argue for toothbrushes and other artificial forces as the cause and those researchers who point to internal physiological sources as the culprit. The latter argument, though not providing a complete explanation, does offer a significant clue to the real cause of this troubling phenomenon. Dealing with hypersensitivity of teeth with non-carious cervical lesions is a difficult task. These were thought to be erosion- abrasion lesions. It was Grippo, who originated the term ‘abfraction’, in 1991 to describe the pathologic loss of tooth enamel and dentin caused by biomechanical loading of forces.